Tashkent has been a treat for exhibitions this autumn. The stand-out was Madina Kasimbaeva's "The Sacrament of Magic Yarn". Madina is an acclaimed embroiderer, who won the 2016 Best Crafts Person of Uzbekistan prize for her extraordinary work and contribution to Uzbek applied arts traditions. Although her grandmother embroidered skullcaps, Madina does not come from an embroidery dynasty. In fact, her parents hoped that she would become a translator. However, after excelling in gold embroidery techniques at high school, she entered the Tashkent Republican Art College named after P.P. Benkov, in the School of Fashion Design. It was there that she started to seriously research the varied embroidery traditions of all Uzbek provinces. Her talent was recognized early and at age 20, in 2007, she became a member of the National Union of People's Craftsmen and Artisans - known as Hunarmand. In 2008 she participated in Fashion Week, Milan, where her jackets and accessories were snapped up instantly. 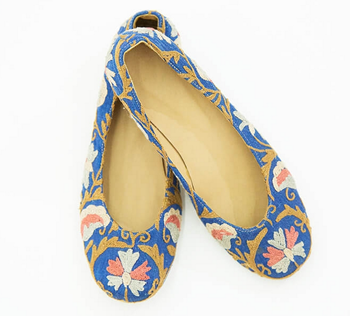 Committed to educating Uzbeks about their unique traditions and ensuring those traditions flourish, Madina took a mirco-credit loan in 2008 and has since trained over 500 young women in suzani embroidery techniques. Madina has proudly represented the applied arts traditions of Uzbekistan in exhibitions in Moscow, Baku, South Korea, Europe and the US. She regularly participates in the Santa Fe International Folk Fair. In this exhibition Madina again collaborated with art historian Binafsha Nodir and again the exhibition was held at the Tashkent House of Photography. 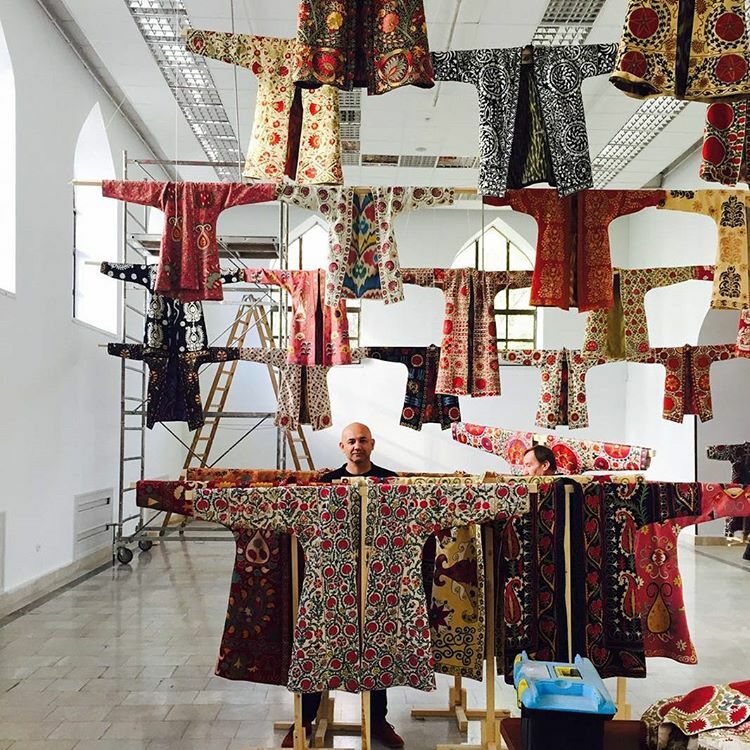 The light in the building is excellent and renowned Uzbek artist Babur Ismailov coordinated the installation of chapans (traditional robes). The chapans were embroidered using techniques from the major Uzbek embroidery regions: Bukhara, Samarkand, Nurata, Shakhrisabz and Tashkent. 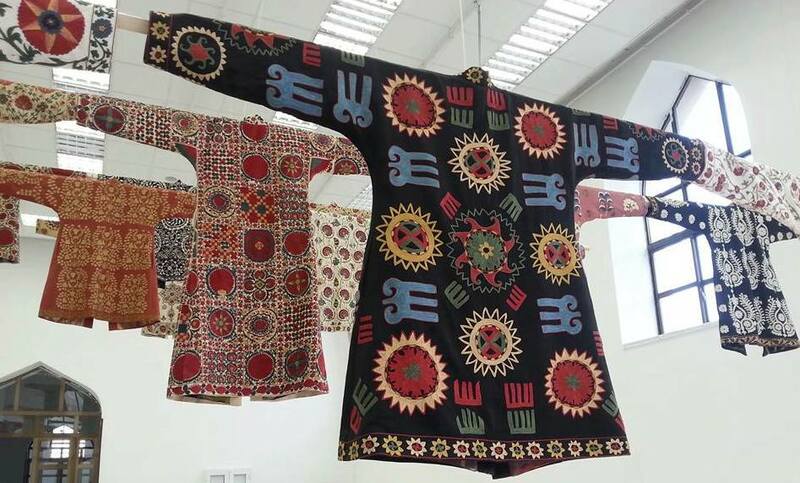 Unusually, this chapan (Uzbek robe) was embroidered in wool. 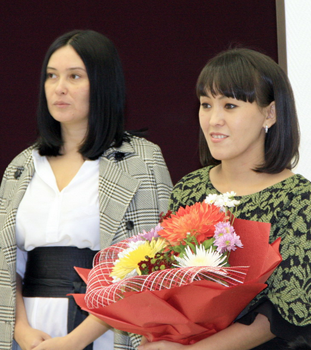 Recently Uzbek Journeys organised a suzani master class with Madina at her home in Tashkent. Some clients were already skilled sewers and others, dilettantes. However, we were all flabbergasted at how difficult and time consuming suzani embroidery is. After about 40 minutes of generally slow and poor progress, we abandoned our class and instead raided Madina's collection - many of the pieces were being made for this exhibition. Her work is easily the finest quality in Uzbekistan. Please enjoy more images of Madina Kasimbaeva's work below. Update August 2018: Madina's exquisite pieces are now available at Human House, Tashkent. The Fantasy World of Uzbek Textile Artist Dilyara Kaipova. 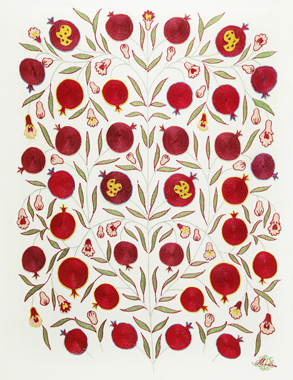 A pomegranate embroidered wall hanging. Note Madina's signature bottom right.